The Tablet Z’s 1920 x 1200 screen has a pixel density of 224dpi which falls short of both the Nexus 10 (299dpi) and the iPad 4 (264dpi). To be honest, those differences are academic. I’ve peered closely at the Z and iPad 4 side by side and even with my nose pressed against the glass there really is little discernable difference. I don’t recall the Nexus 10 being all that much sharper. The shatterproof glass display - like the Asus FonePad’s screen, it’s not Gorilla Glass but something similar - is a conventional TFT LCD affair rather than IPS or PLS as used in the iPad 4 and Nexus 10, respectively. That means viewing angles and contrast though good are not up to quite the same levels but when playing video the difference is overcome by Sony’s Mobile Bravia Engine 2 image processing. Playing a 1080p video on the Z is a very rewarding experience though there could be a little more brightness on offer for outdoor use. When it comes to actually holding the thing, Sony roundly clobbers the competition. The Tablet Z is 108g lighter than the Nexus 10 and 157g lighter than an iPad 4. That’s essentially a whole smartphone less and makes the Z a very easy device to hold for prolonged periods, even single-handedly. When I first pulled the Tablet Z out of the box I was shocked how light it felt. Hauling the coal is a Qualcomm Snapdragon APQ8064 quad-core 1.5GHz Krait CPU with 2GB of Ram and an Adreno 320 GPU. That’s a solid spec for a high-end Android device and gives the Tablet Z an impressive lick of seed. The GPU has absolutely no problem shoving all those pixels about when running games like Real Racing 3 and Shadowgun: DeadZone even if it lacks the ultimate on-paper grunt of the Nexus 10’s Mali-604 graphics core. 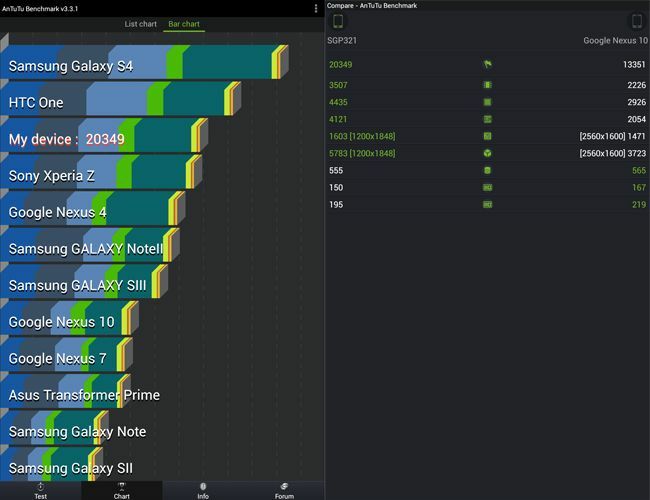 Running the usual benchmarks, I found AnTuTu returned an average score of around 20,500 while the SunSpider browser performance test ran in an average of 1500ms on Chrome. Only the likes of the HTC One and Galaxy S4 can offer any serious improvement on those numbers. Like other recent Xperia devices, the Tablet Z runs Android 4.1.2 but here the launcher is a little closer to stock than it is on the Xperia SP or the Z. 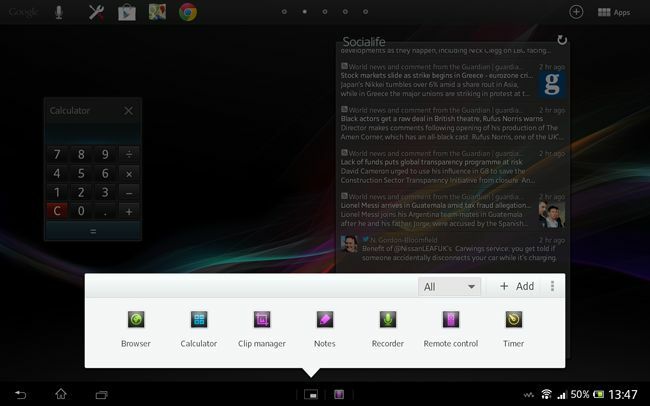 Like its smartphone counterparts, the Z Tablet gets Sony’s Small Apps launcher on the taskbar but there’s also a very handy shortcuts bar at the top of the screen so you can launch often used apps no matter what screen you are on. One of the widget-like Small Apps is a cut-down version of the excellent pre-loaded remote control app. Combined with the IR blaster this makes the Tablet Z a fine device for controlling your home entertainment system. As I’ve said before, I like Sony’s media apps a lot. 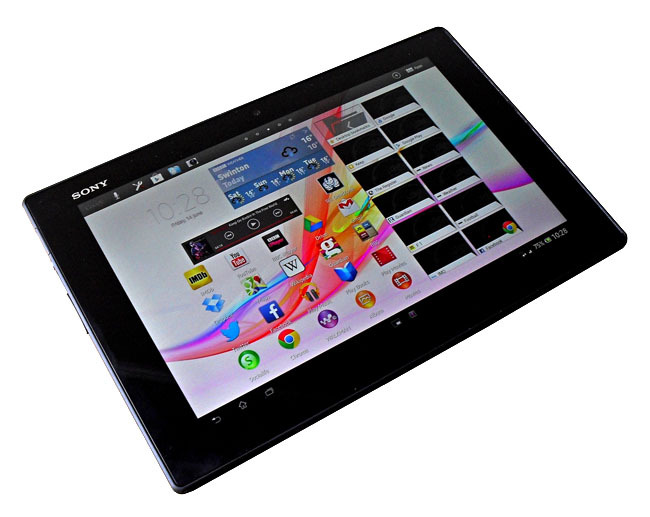 They make the Tablet Z a truly superb device for listening to music, watching video or looking at still images. The web-connected video and Walkman music players and the picture album are object lessons in How It Should Be Done. Other OEMs and Google, take note. The media apps aren’t let down by the sound system either. The stereo speakers, each of which fire out of the bottom and side of each lower corner, sound good and there’s ample volume available. Things get even better when you plug in a decent pair of headphones. The sound from the Walkman app, with or without the various filters engaged, is up with the best I’ve ever heard from a mobile device. It makes the Play Music app sound a bit two-bob by comparison.